All of us in Holwell are connected to the Scalford Exchange on what are known as “Exchange Only” (EO) lines. In other words, there are no junction boxes between us and Scalford, just more than 4kms of copper cable. Broadband speeds drop off significantly over the length of copper cable. SuperFast Broadband (SFBB) speed – defined as 24Mbs download – can not be achieved over more than 1.4km of copper cable. Ab Kettleby – connected to the Nether Broughton Exchange – has recently had a fibre cabinet installed, due to go live by Christmas 2014. But we are not connected to Ab Kettleby and BT rarely undertake such “network re-arrangement”. BT and other providers have already connected c75% of the country to SFBB. Melton Mowbray is one such area – you have probably seen the fibre cabinets along Scalford Road. The Government has funded a programme to bring SFBB to those areas of the country not covered by BT’s commercial rollout (above). This programme is called Broadband Delivery UK (BDUK) and Melton Borough Council (MBC) has also contributed financially. Read more about BDUK here: https://www.gov.uk/broadband-delivery-uk It is anticipated that 94% of the country will be connected to SFBB as a result. However, in the MBC area that number drops to 80%. If you click on the Scalford Exchange tile of the map on LCC’s site: http://www.superfastleicestershire.org.uk/when-and-where/ it says “Holwell and Scalford are due to get fibre broadband from the summer of 2015 to the end of March 2016”. However, LCC and BT have been unable to confirm to us exactly how we will be connected. Our assumption, based on close reading of developments elsewhere, is that BT will place a single fibre cabinet next to the Exchange in Scalford and connect to it all the existing copper cables. That means those living close to the cabinet, such as everyone in Scalford village, should enjoy SFBB speeds. However, in Holwell, due to our distance from that cabinet, it is likely we will see no significant increase in speeds. To get SFBB in Holwell we really need our own fibre connection. The challenge is to convince LCC and BT to fund the work involved for a relatively small community of c46 homes. 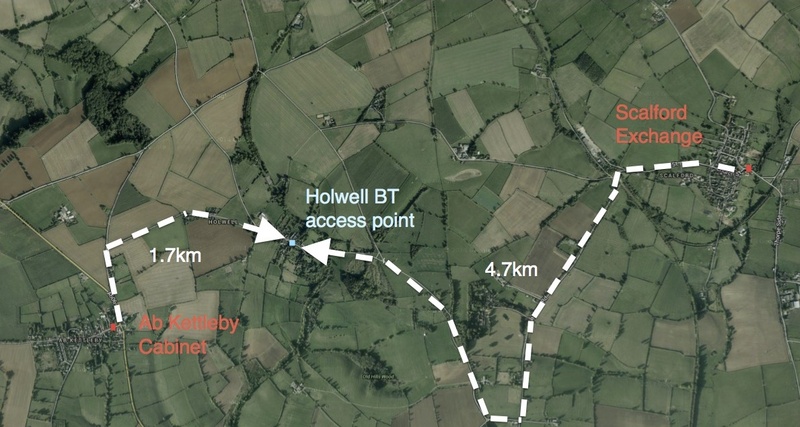 We may be able to encourage a Wireless Internet Service Provider (WISP) to provide coverage to some or all of Holwell. This would entail receiving a signal from a mast nearby and re-broadcasting it to houses here that sign up to the service and install a modestly-sized aerial. Download speeds of c10-20Mbs can be achieved and a range of data packages may be available. You do need to install a fair-sized dish on your house with line-of-sight to the satellite and it can be expensive. Download speeds of c10-20Mbs can be achieved and a range of data packages are available. I am not aware of any plans to rollout 4G coverage in our area. I can’t even get 3G in Holwell! Although 4G can offer download speeds of c8-10Mbs, the data is likely to be capped quite significantly.